Hunger is not inevitable but it is man-made. It can therefore be solved by our action. Our behaviour is guided by economic policies implemented by our governments, as illustrated by the analysis of recent food crises. These policies are the result of the political situation prevailing in our countries or group of countries (including the United Nations), as demonstrated by the analysis of the food and agricultural policy paradox. To change the economic policies in place, there is need to modify the political balance in favour of those who are penalised by current policies and are the main victims of hunger - small farmers, landless labourers, women, youths and urban poor. By organising themselves in associations, these victims will turn into empowered stakeholders able to express their claims and with sufficient weight to influence decision-makers, conduct effective collective actions and back candidates in local and national elections to ensure that the voice of those who, today, are excluded from the political arena, will finally really and authentically express their views in all fora in the future. This is the next step in the development of the democratic management of our countries. These organisations must become the mandatory route for development actions. Why should land be leased or sold to external investors when it can be given to rural associations or groups who then can engage in agreements with external investors if they so wish, according to legally and clearly defined modalities, designed in advance, and that protect the interests of the population? A higher level of organisation of the rural and urban poor is the sine qua non condition to eradicate hunger. The organisation of consumers can also help the improvement of food quality and safety and ensure that agricultural policies are geared towards the development of an ecologically sustainable quality agriculture. Any national budget should have an important component to fund the development of associations. Any development programme, whether funded by the government or bilateral/multilateral aid, should have a package for supporting the organisation of its beneficiaries. A lack of support for community development and the creation of associations will make programmes less efficient and less likely to have lasting effects. Archives are full of ‘‘successful’’ development projects which have left no trace whatsoever in the field a few years - sometimes a few months - after their closure. This undertaking will not be easy, as has to starts in most countries from a very low level. There will be resistance as well as attempts of takeover of the associations created. This will make this effort risky and awkward. Past experience the with forced organisation of agricultural producers into cooperatives has left scars in rural areas and has generated in some places a strong prejudice against any kind of group formation. This prejudice will have to be reversed. But there are also a number of good precedents on which to build. 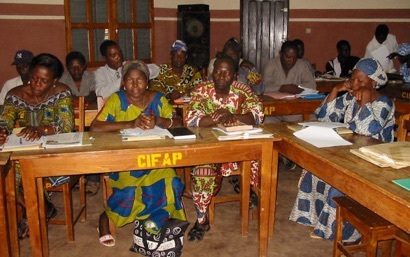 In many poor countries, there is now experience of farmers coming together to create associations to defend their interests, to engage in learning activities (e.g. Farmers’ Field Schools), to produce and market their products, and many are growing or joining larger networks as farmers come to recognise the economic and political benefits of working together. Some national farmers’ unions have already succeeded in having a voice in quite a number of countries, and their networks like ROPPA (Network of Farmers' and Agricultural Producers' Organisations of West Africa) at the regional level and La Via Campesina at the international level have been able to be actively present in the debate on food and agriculture. At the global level, the reformed Committee on World Food Security (CFS) offers now a platform through which farmers’ movements can contribute to global policy setting. Khadka, S. Small farmers institutions: What next?